Listed here are a few ways to make your home and property less habitable for scorpions as well as other pests. All of the tips are simple and can be completed in under an hour at any home for very little cost. By pruning you’re landscaping, removing pest habitats as well as repairing entry points you’ll be able to limit pests in your home and yard. Mint leaves are a great way to fight against fleas brought in by our pets. Simply soak one part mint leaves in three parts water and spray the areas your pets spend the most time, do this for at least five days for maximum results. Scorpions are a major problem in Las Vegas. A few steps you can take to make your home less appealing to these pest are keeping a tidy yard, planting lavender around the house, filling your cracks around the house and taking action when you run into one. A way you can take action is catching it then releasing the scorpion somewhere else or humanely killing it with a quick boot stomp. Keep a tidy yard. Scorpions love a big moist leaf pile or large river rocks to live under. Taking away the piles of anything will force them to go to the next messy lawn for residence. You will need to maintain a well-groomed landscape. Unattended bushes and trees can be perfect homes with regard to pests, a single Honies Mesquite can harbor a large number of scorpions. Maintaining the little repairs that appear around the house is another great way to combat scorpions and other pest like cockroaches and ants. These repairs include fixing windows, window frames and screens when tears or cracks appear. The smallest tear can provide an entry point for a single cockroach which eventually can lead to an infestation of hundreds of other cockroaches. 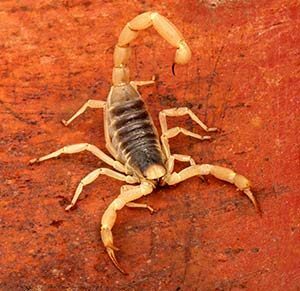 As one of the top scorpion control in the Las Vegas area, we pride themselves on early detection of your pest and rodent problems and provide you fast extermination of your infestation, while also supplying you with regular treatments around the parameter of your home to shield you against future pest problems. Our services come with a De-Bug guarantee meaning if for whatever reason your pest are not eliminated the first time, we will continue to treat your home till all traces of your pest are completely eliminated. I have not seen a single bug in my house since using Ace Pest Control. The technicians (especially David) are always on time and extremely professional and friendly.